It’s almost the week of Easter! 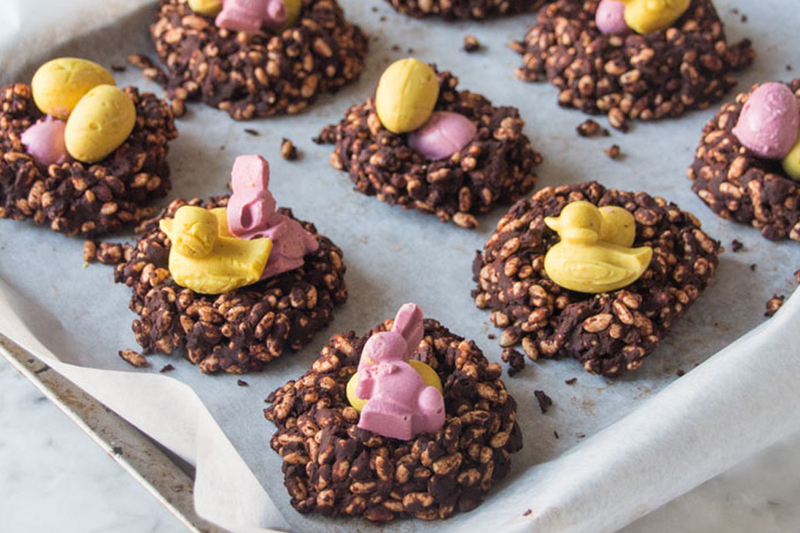 To celebrate the holiday here are our favourite recipes for Easter treats to indulge in, providing the perfect time to bake and spend time with family. Preheat the oven to gas mark 7/220ºC/425ºF. Take the dough out of the fridge and let it come to room temperature. Punch the dough down, and knead it again until it is smooth and elastic. Divide into 16 balls and shape into smooth round buns. I wouldn’t start worrying unduly about their size: just halve the dough, and keep halving it until it’s in eight pieces, and use that piece to make two buns. Or just keep the dough as it is, and pinch off pieces slightly larger than a ping pong ball and hope you end up with 16 or thereabouts. Not that it matters. Sit the buns on a baking parchment or Bake-O-Glide-lined baking sheet. Make sure they are quite snug together but not touching. Using the back of an ordinary eating knife, score the tops of the buns with the imprint of a cross. Cover with a teatowel and leave to prove again for about 45 minutes – they should have risen and almost joined up. These are perfect for cooking with the kids, as they are fun, easy and yummy to make! Ella fills the nests with her own Easter egg creations, but you can put in whatever candy/decorations that your kids want in the nest for a seriously cute Easter treat! Note: The nests (and the eggs) are best made a day before serving, so that they can be left in the fridge to set properly. 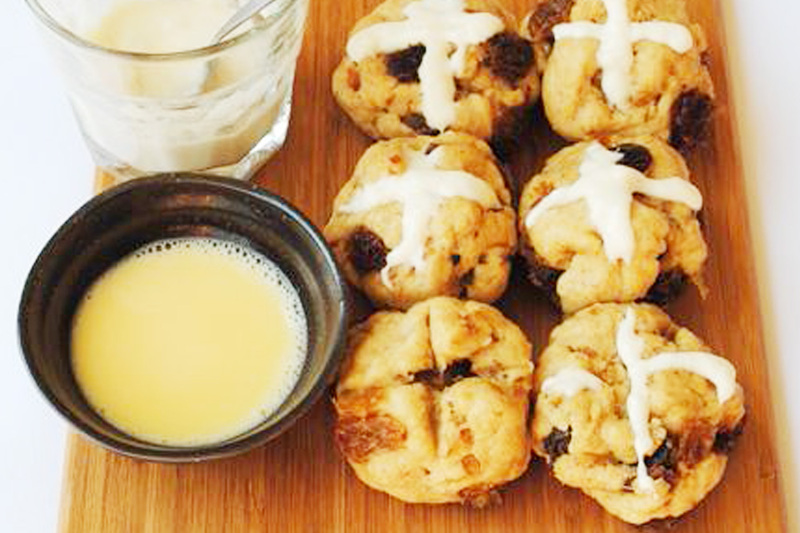 These Easter scones are inspired by the full flavours of hot cross buns, but with a much easier recipe. They would look adorable on the table for Easter brunch. 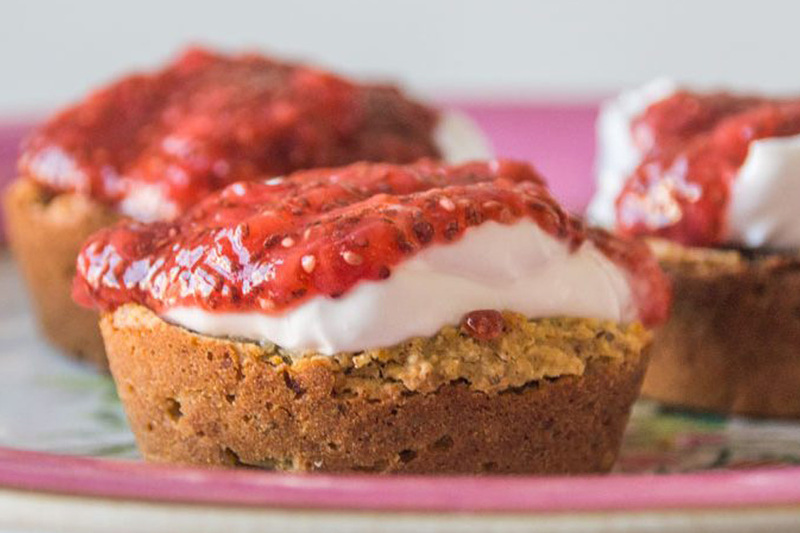 Top them with coconut yogurt or cream, along with your favourite jam! Start by pre-heating the oven to 180C. Mix 1 tbsp chia seeds with 3 tbsp spoons of water in a cup and leave to one side to to absorb. Process two cups of oats in the food processor until they form a fine flour. Place the oat flour in a large mixing bowl and process one cup of almonds in the food processor until they form a fine flour. Add the almond flour to the oat flour along with 1/2 cup raisins, 1 tsp ground cinnamon, 1/4 tsp ground cloves and 1/4 tsp ground nutmeg. Add the zest of one lemon and one orange to the dry ingredients and mix thoroughly. Squeeze the orange juice out of the orange and add 1/3 cup orange juice to the dry ingredients. Then measure pour in 1/2 cup almond milk, 3 tbsp maple syrup and the chia egg into the mixing bowl. Grease a muffin tray with coconut oil and spoon the mixture into the tray. Bake for 20 minutes until the tops are golden brown. Leave to cool before topping with coyo and homemade strawberry jam to serve.